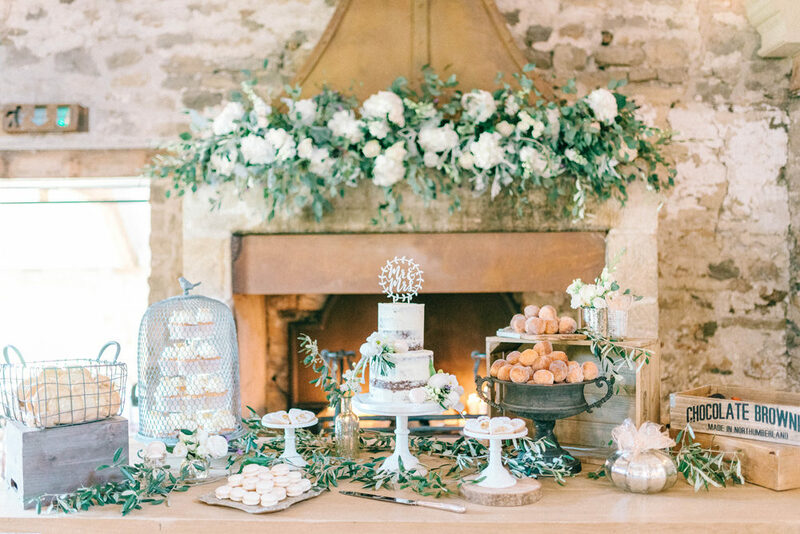 If there was ever a time for an epic dessert table, then Sunday morning is it. 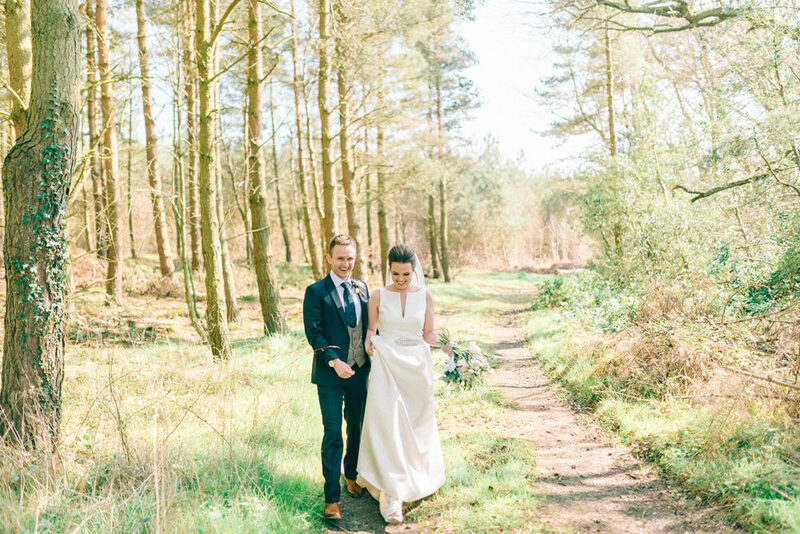 Lauren and Tom filled Healey Barn with foliage, white flowers and lots and lots of cake. 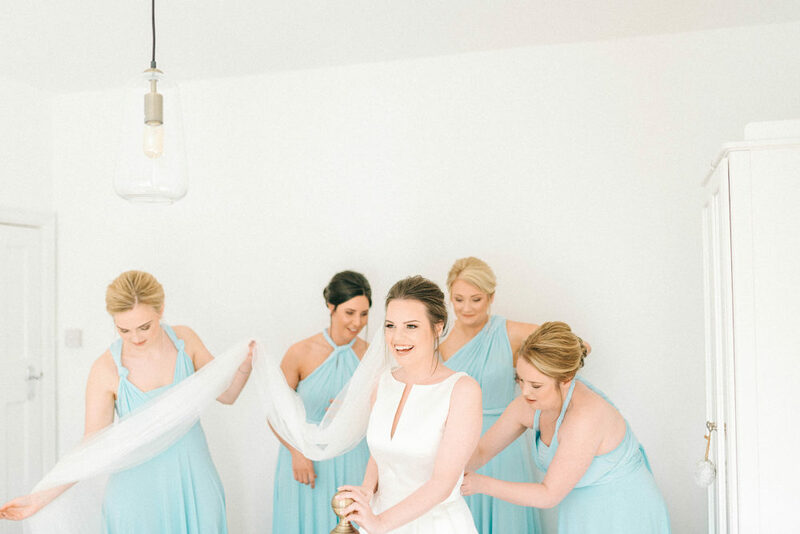 Lauren looked stunning in a high necked Jesus Peiro gown and her bridesmaids added the most gorgeous pop of something-blue in multiway dresses. 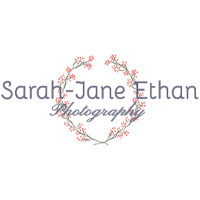 Images come from Sarah-Jane Ethan, whose soft and romantic style never fails to put a smile on my face. Enjoy this one beauties, it’s elegant yet rustic and oh so perfectly styled. 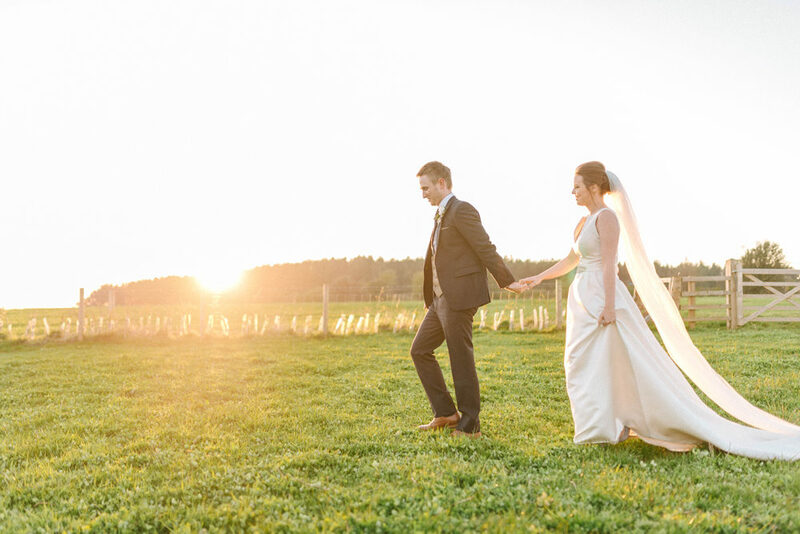 Lauren the Bride: I wasn’t a bride-to-be who knew exactly what they wanted and I wasn’t lucky enough to only need to visit one shop (I wish!) I tried on so many dresses, everything from fishtails to ball gowns, lace to satin! I was at the point of thinking I would never find ‘the one’. Luckily for me my mam and sister were there for every appointment (and there were a lot of appointments!) My mam was given a recommendation of a fantastic bridal boutique in Northumberland (Bridal Wish), so she decided to book an appointment for me at with the lovely owner Wendy. Thank god she did! Wendy was amazing she put me completely at ease and reassured me that I would find something perfect for me, which I did! She selected my Jesus Peiro dress after listening to what I liked and didn’t like from the many dresses I had tried on previously. It was perfect, a traditional shape, high neck and to top it off pockets! As the dress was quite traditional I wanted a slightly quirky pair of shoes. I opted for a light blue pair of heels from Dune to match the bridesmaids dresses. The only advice I can give is keep on trying, you will find ‘the one’! 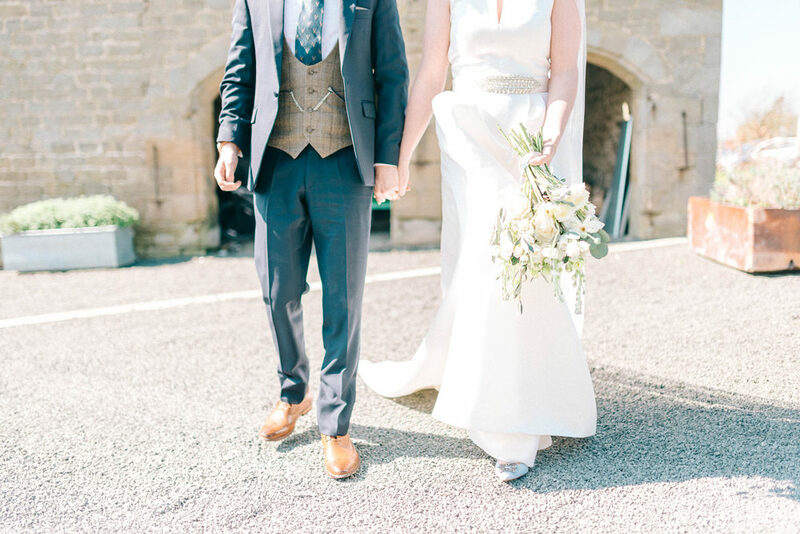 Tom the Groom: I really wanted a tweed bow waistcoat and all the usual suspects on the high street didn’t offer this. I came across a wonderful independent suit shop called Whitfield and Ward, in Wilmslow, that offer a magnitude of different styles, shapes and colours using fantastic materials. I opted for a dark navy suit with the tweed bow waistcoat I had craved and a navy and brown stag tie (it looked a lot better than it sounds!) finished off with tan brown brogues and a pocket watch. The groomsmen and fathers were fitted with the same suit and waistcoat but with a light blue tie to match the bridesmaids! The staff at Whitfield and Ward were superb and we could not have been happier with the quality and look of the suits! 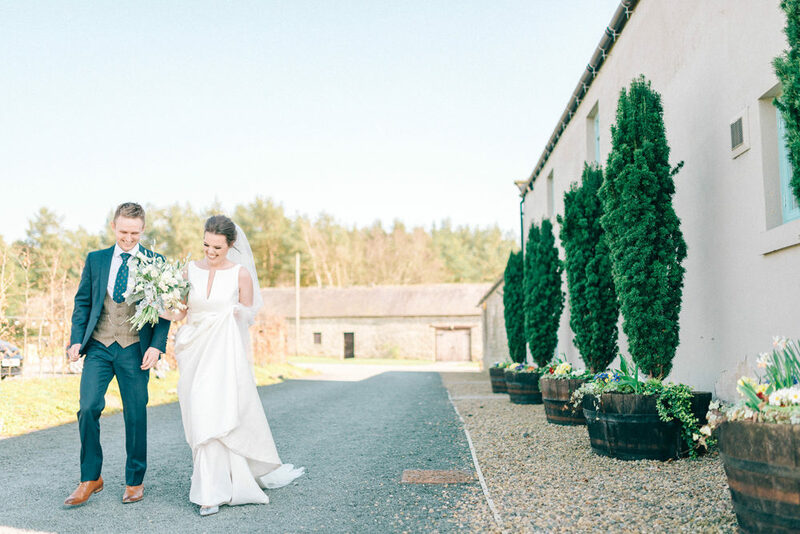 We knew we wanted something slightly different, to the traditional grand house, and I wanted to ‘show off’ the amazing landscape of Northumberland to some of Tom’s family, who had never visited the North East. Barns in the North East are few and far between so when Tom found Healey Barn online, I knew this could be it. We first visited Healey Barn when there was no floor or roof, it was literally a building site! But we knew instantly it was the venue for us and we booked it there and then! We were reassured by Lianne, at Healey Barn, that it would look spectacular when fully renovated and she wasn’t wrong. The flagstone hall, with curved beams and grand fireplace was just perfect for us! 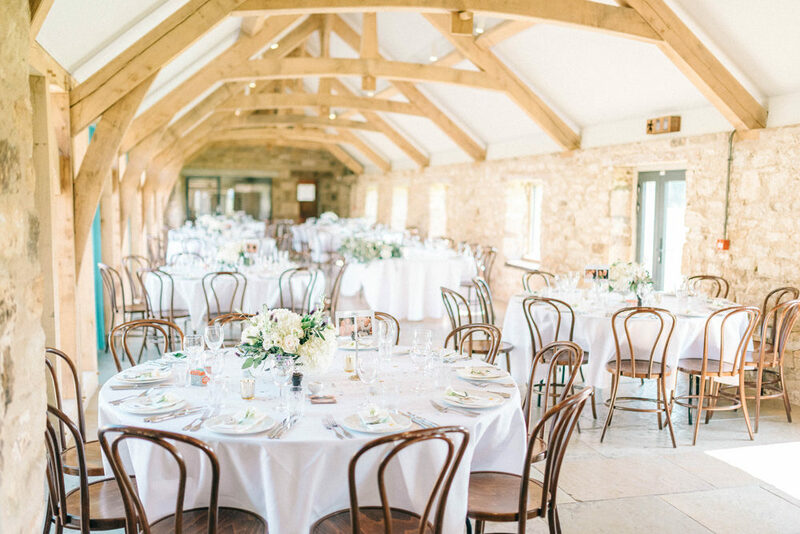 So many of our guests commented on how beautiful the venue was, I would recommend Healey Barn to anyone! This was one of the biggest dilemmas for the wedding! We got engaged 2 1/2 years prior to the wedding and over that time every colour imaginable was debated, whether it be pink, lilac or mint but finally we decided on baby blue, much to Tom’s, a die hard Man Utd supporters, disappointment. When considering the finer details we wanted to incorporate elements of special meaning to our wedding. We hand made clay heart place names and each guest was given a charity pin for three amazing charities which are very close to our hearts. We wanted to remember all the loved ones who had played such a large part in our lives, so at the entrance of the barn we had wedding photos of close family past and present, and pictures of us growing up with our grandparents and family members, some of whom sadly couldn’t be with us. Coincidentally it was also Grand National day we played upon this and gave each of our guests a betting slip for one of the horses in the race. This was great fun and the winners especially loved it! As we wanted to keep our guests fresh and fragrant, we provided a toiletries box and flip flop hamper in the toilets. The women especially enjoyed the heel relief! Although some decisions for our special day were hard to make, the florist certainly wasn’t! 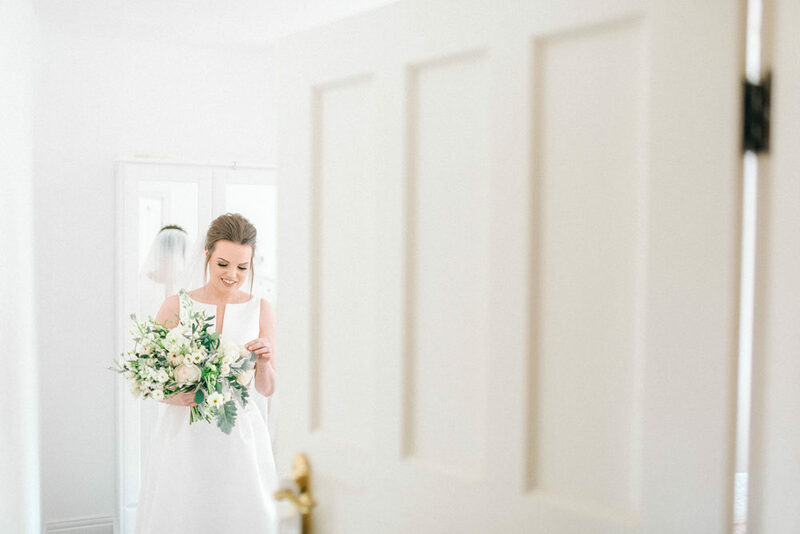 As soon as we saw Helen’s work we knew we needed to have her work her magic at our wedding, and she certainly didn’t disappoint! We gave her an initial brief that we wanted white flowers with a lot of foliage. 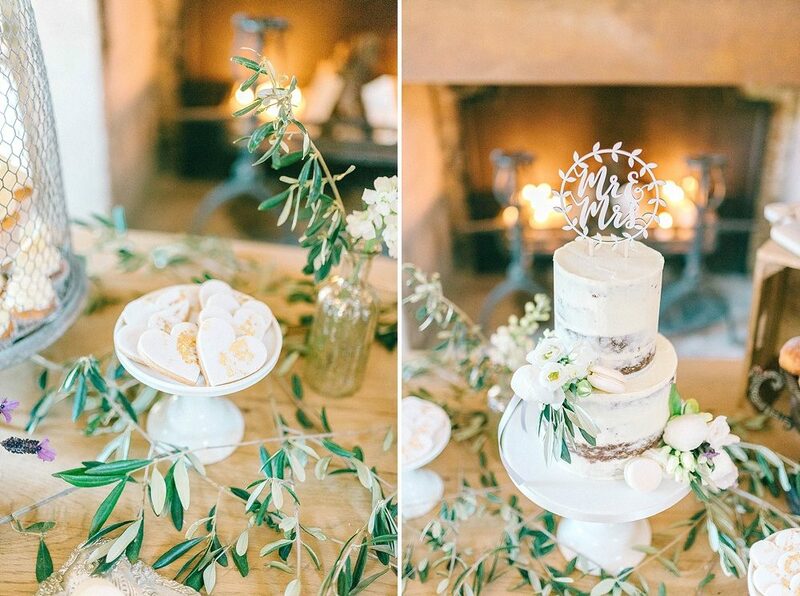 From that she was able to create wonderful centre pieces, bouquets and garlands for both the top table and fire place from my limited direction. So many people commented on how beautiful the flowers were and we can’t thank Helen enough! Bride – Coincidentally both my grandparents were named after flowers (Rose and Violet), so I wanted to include both of these flowers into my bouquet. Along with the the clay heart each guest was given a single flower, adding an extra floral element to our wedding favours. I wanted the bridesmaids to feel as comfortable and happy as possible on our big day. That is why I picked a multiway dress for my bridesmaids to wear! We got the dresses from an etsy shop and I could not have been happier with the way my bridesmaids looked on the day. They all looked beautiful! This was a really important part of the day for us. I really wanted to get married at St Patrick’s Church, a gorgeous grand Catholic Church, and the same church my parents, grandparents and great grandparents all got married in. It meant a great deal that I could carry on the ‘family tradition’. It wasn’t ideal in terms of location to the venue, but we provided coaches for the guests filled with alcohol to keep spirits up. Although it was a full catholic ceremony, we tried to include personal touches, with our mams doing the offertory, aunties giving communion and I even managed to walk down the aisle to a Doctor Who song (Clara Oswalds song) I still don’t know how I managed to sneak that past the Priest! We really didn’t want any guest to feel hungry during our day, as there is nothing worse. 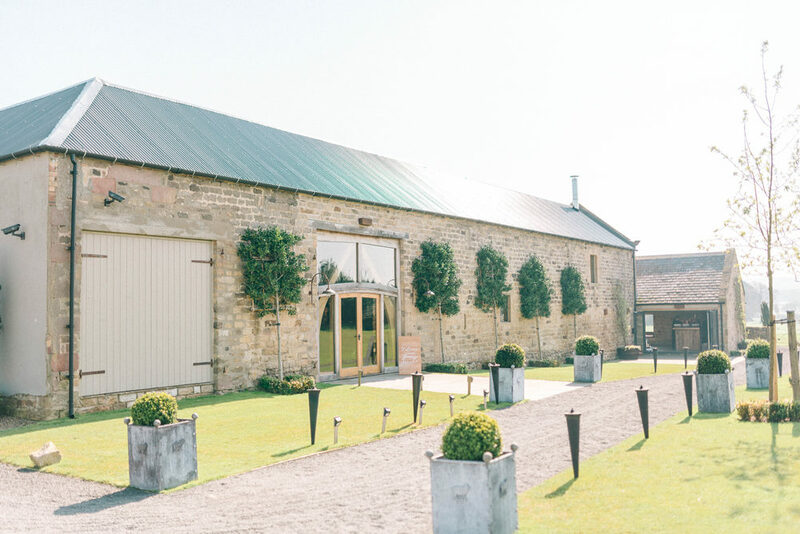 Healey Barn were great in meeting all of our needs, even providing Dr Pepper as a drink of choice for me on arrival and during the toasts! We chose 4 canapés for our guests, and although they kindly put us a plate to one side we didn’t have the chance to try them we were just too busy. This is still a regret as we told they were to die for! For the wedding breakfast Healey specialises in large BBQ style food which is served in the middle of the table for your guests to tuck in! This was such a good idea as it got the tables talking and they could help themselves to as much or little as they wanted. In the evening Healey Barn offer a range of food options, but we decided on the stoneoven pizzas, which were amazing! The big show stopper of our day had to be the cake table, made by the amazing Dawn. This was placed in front of the fire place! I think everyone agreed all the little treats tasted as amazing as they looked! She did such an superb job. Also as Dawn and Helen our florist work together regularly, Dawn was able to ‘steal’ a few flowers to make the table look even more spectacular! For the entertainment, we have attended so many weddings recently and seen such an array of entertainment that we struggled to decide what to do. In the end we decided to have a magician during the day, Chris Cross who performed his humorous magic during the canapés and the start of the meal, and a supremely gifted 6 piece Motown band, who kept everyone dancing until late into night. So much so that the coaches almost left with people still on the dance floor! What can I say about such a lovely and talented lady. We were so lucky that SJ was available for our wedding, it was a good job we booked her 2 years in advance! As soon as we saw her natural and beautiful photos we knew SJ was the one for us. We aren’t the most photogenic of couples (Tom!) but she managed to instantly put us at ease and capture the day in the most perfect way, full of laughter and love. We have so many photos that we need to whittle down to make an album which we think is going to be an impossible task. We can’t thank SJ enough!